The prefecture of Heraklion lies between Rethymno and Lassithi and is the most densely populated as well as the financial center of the island. It was the center of Minoan Civilization and therefore contains some of the most important archaeological sites on Crete. The Minoan palaces of Knossos, Malia and Phaestos, as well as Gortyna, the Roman capital of the island, are a clear reminder of the importance of the fertile Messara valley even today. The most touristy parts of the island, such as Hersonissos, Malia and the rest of the northern coast are also found in the Heraklion prefecture. However, there are still villages that have retained some or all of their traditional atmosphere and charm, such as Archanes, Ano Viannos and the remote village of Lendas. 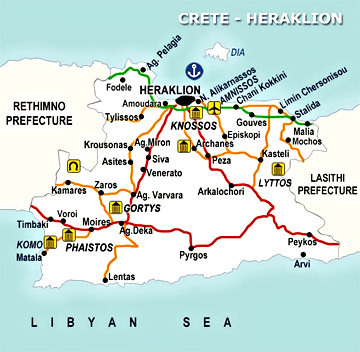 The city of Heraklion, the capital of Crete, is the 5th largest city in Greece. It is the business and social hub of the island and is a modern, particularly lively town which offers every kind of experience and form of recreation both in summer and winter, with much to do and many things worth seeing. It is a favorite choice for those seeking a dynamic restaurant, café scene and vibrant nightlife. 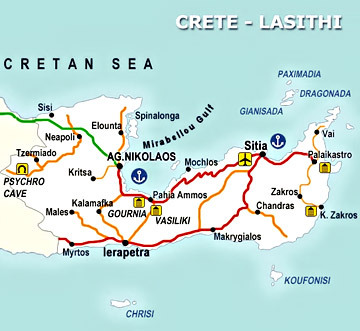 Wine lovers should check out the new Wine Roads of Heraklion at www.winesofcrete.gr. The annual Heraklion Summer Arts Festival takes place from July to September, bringing together internationally-renowned acts for over 70 different performances. 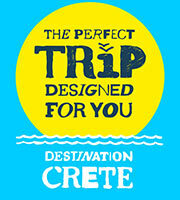 For details, visit www.heraklion.gr. In the heart of wine country there is a Wine Festival in Arhanes each August and one in Dafnes in July. 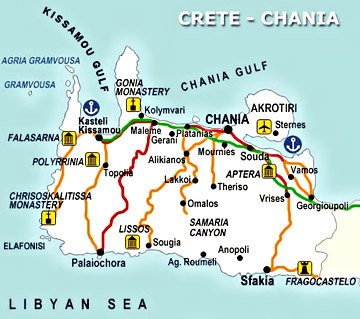 Many visitors to Crete consider the prefecture of Chania to be the most beautiful on the island. This western end of Crete is marked by an endless, indented coastline, steep gorges, many canyons and lush vegetation, as well as cultural monuments both ancient and modern. Off the southern coast is the island of Gavdos, the southermost part of Europe. Other must-see beaches in this region include Elafonisi, a secluded islet off the southwest coast and Falasarna as the westernmost tip of the island. The most outstanding geograhical feature in the Chania region is Souda Bay, the largest natural harbour in the Mediteranean, now used as a naval base. The famous Samaria Gorge (the longest is Europe) is an impressive place of natural beauty, which as part of the White Mountains National Park covers 4,900 hectares between Omalos and Agia Roumeli. The town of Chania, built on the site of the ancient city of Kydonia, used to be one of the best-kept secrets of the Greek Islands, yet even now that tourists come in droves, it has managed to keep its atmospheric charm, replete with Byzantine, Turkish and Venetian influences. Even when thrashed by a sudden storm, the focal point of Chania harbour always possesses a unique charm. Walk around and the see the old houses with their typical blend of Venetian and Turkish elements, or stroll the many parks and squares in this well-designed and planned city. 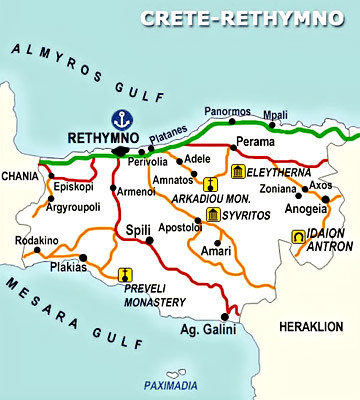 Rethymno prefecture is surrounded by mountains, with its outstanding symbol- Mount Psiloritis as the highest (2456 m) and most famous. It is also replete with well-preserved towns and Venetian monuments, offering a great variety of opportunities. Due to its mountainous nature, the prefecture contains impressive ravines, caves, waterfalls and mountain villages, where visitors can savour the best Crete has to offer. Some of the most beautiful beaches are to be found where the gorges fall into the sea, such as in Agios Pavlos on the south coast. The multi-faceted prefecture of Lassithi at the east end of Crete combines wild mountain beauty with green fertile valleys and picturesque villages. It provides visitors with the most alternatives, since it has threee main centers – Agios Nikolaos, Sitia, and Ierapetra, all of which present different aspects of the island. Agios Nikolaos, capital of the prefecture of Lassithi, is one of the most highly developed tourist towns in all of Greece, literally vibrating with people for 6 months of the year. Despite this, it is still a picturesque, lively town with its small, charming port and myriad of open-air cafés and restaurants along the harbour and along the inner lake. Lake Voulismeni, linked to the sea by a narrow canal, is the biggest attraction in town. The popular resort of Elounda and its picturesque Mirabello Bay, located 9 km from Agios Nikolaos offers a full range of destinations, but is most famous for its plethora of 5-star luxury resorts and villas. For a nice escape, head for the fishing village of Plaka, with its best view of the medieval fortress on Spinalonga.